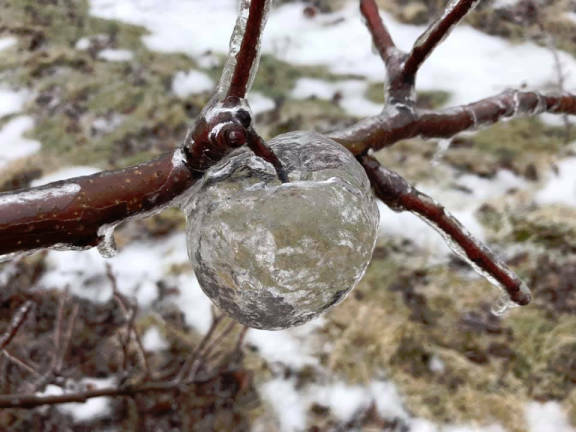 14 Feb 2019 / 10:28 H.
PHOTOS shared by Andrew Sietsema showed apple-shaped ice-casings left after he pruned his trees. “It was just cold enough that the ice covering the apple hadn’t melted yet, but it was warm enough that the apple inside turned to complete mush”, Sietsema said. As he shook the tree to prune it, some of the mushed apples fell through a hole in the bottom of the created case. Sietsema said he had never seen anything like this before and added the ‘ghost apples’ appeared in an orchard block of Jonagold, Honeycrisp, and Gala trees that he planted in 2014.